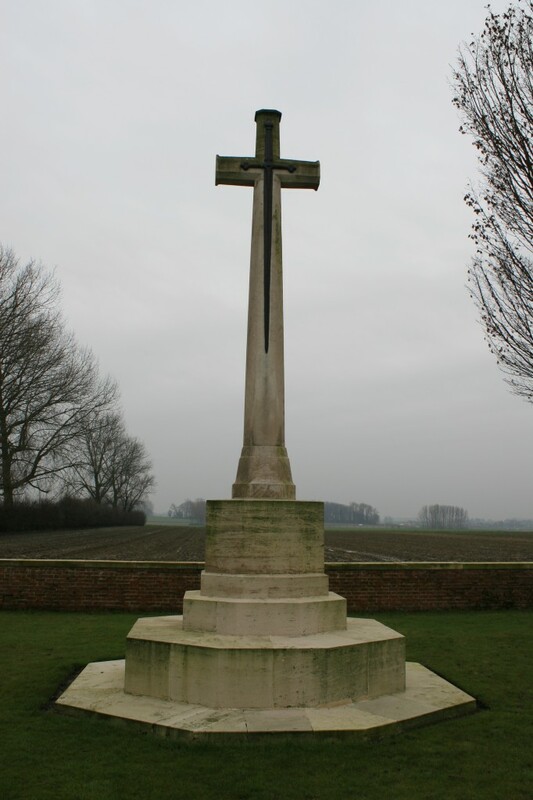 250 yards east of St. Charles de Potyze, the final stop on our tour is Aeroplane Cemetery, so called because in 1917 the wreck of an aeroplane lay near to where the Cross of Sacrifice now stands. The future site of Aeroplane Cemetery lay between the front lines prior to the start of the Third Battle of Ypres (or Passchendaele if you prefer), which began on 31st July 1917; it’s worth remembering, as you peruse these pictures, that we are standing in what was once No Man’s Land. 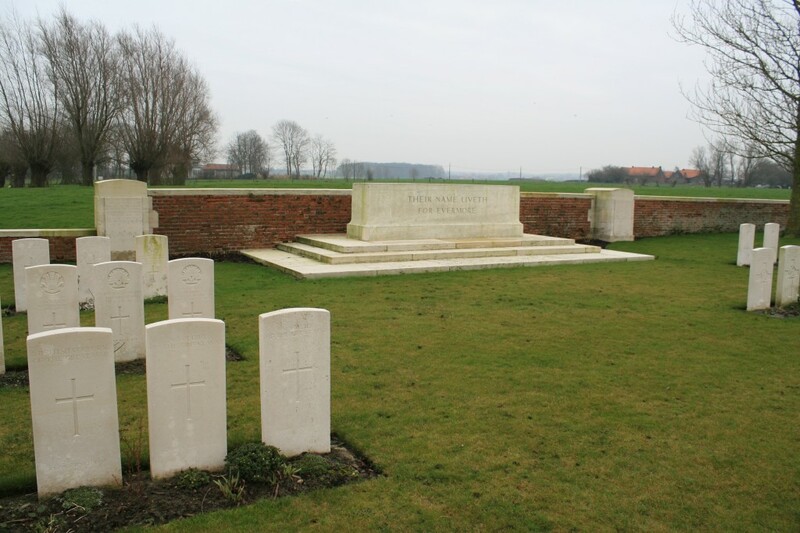 On that day of initial success the British captured Frezenberg, some three quarters of a mile further east, and the first burials here were made soon after (in its early days, the cemetery was known as New Cemetery, Frezenberg). 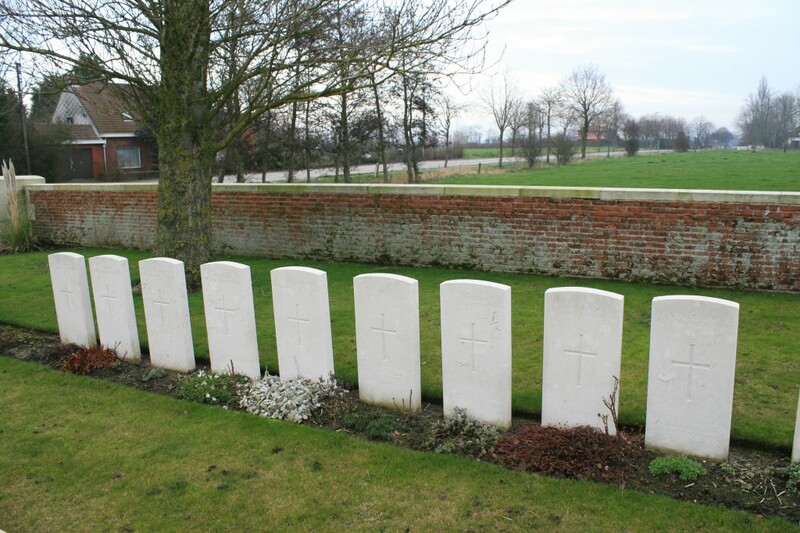 These headstones, with the eastern boundary wall behind, are in Plot IV. 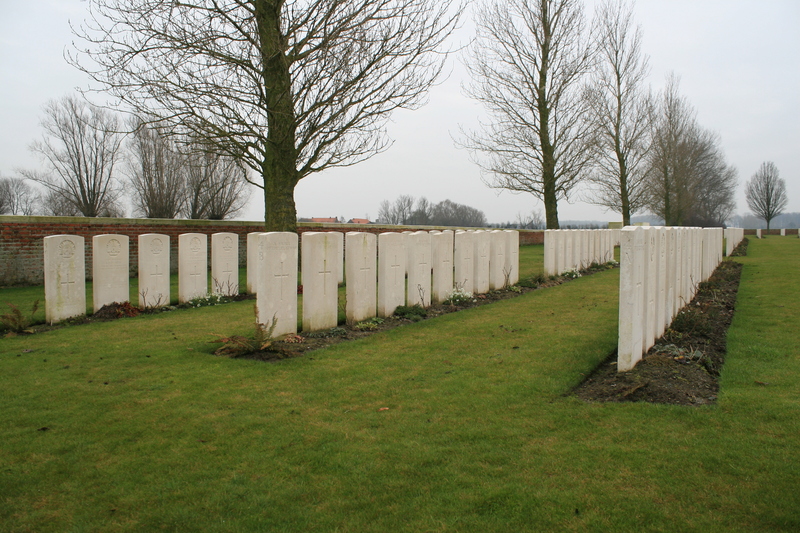 Nine unknown burials in Plot II Row C. Of the 1095 burials here, 636 are unidentified. 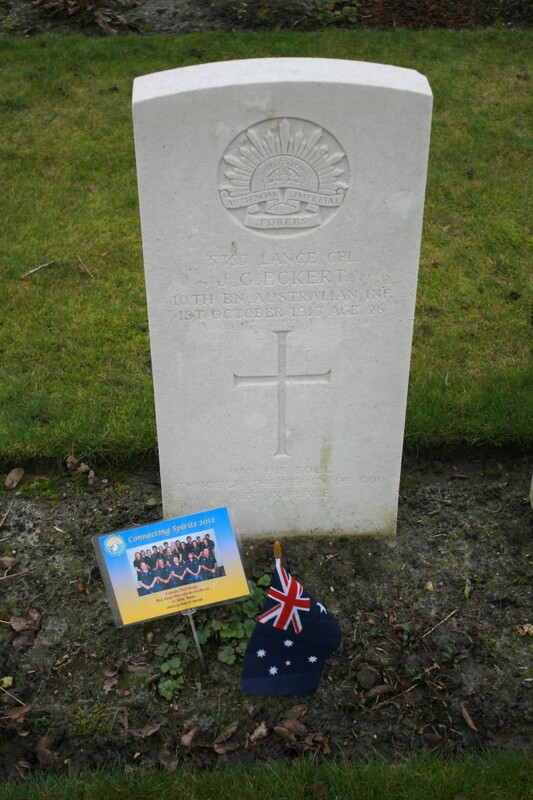 Australian graves in Plot II Row B, of which just one, that of Lance Corporal John Eckert (see below), is identified. The Stone of Remembrance, sited between Plot II (left) and Plot I (right) along the eastern boundary wall. 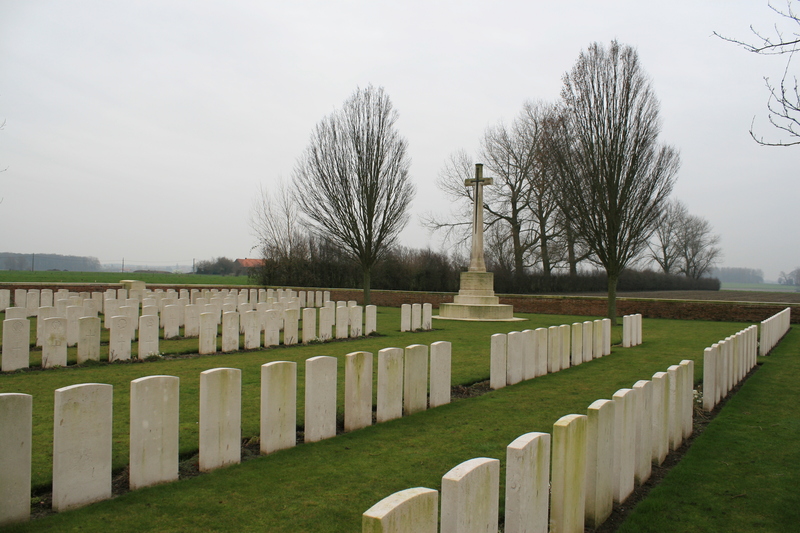 The cemetery was begun in early August 1917 and used until March 1918, and then again after the British recaptured this area in September 1918. The grave of Lieutenant The Hon. Albert Edward Keppel of the Rifle Brigade, son of the Earl of Albemarle, killed on 31st July 1917 aged just 19, with the plaque bearing the “in perpetuity” inscription we have seen so many times before behind to the right. In the background the road heads east towards where the German front line once ran. 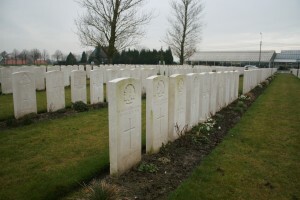 The wartime burials were all made in what is now Plot I (foreground). After the war Plot I was expanded and Plots II to VIII added, mainly men brought in from battlefield graves, but also from two smaller burial grounds, Lock 8 Cemetery at Voormezeele, and Bedford House Cemetery Enclsure No. 5. 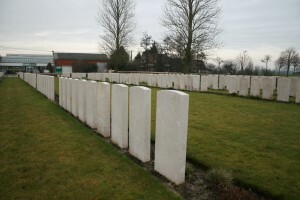 The headstones in the background are part of Plot VI. Looking west at the same headstones in Plot VI as we saw two photos previously. Unidentified burials in Plot VI. Looking back towards the Cross of Sacrifice from Plot VI, Plot I in the left background. 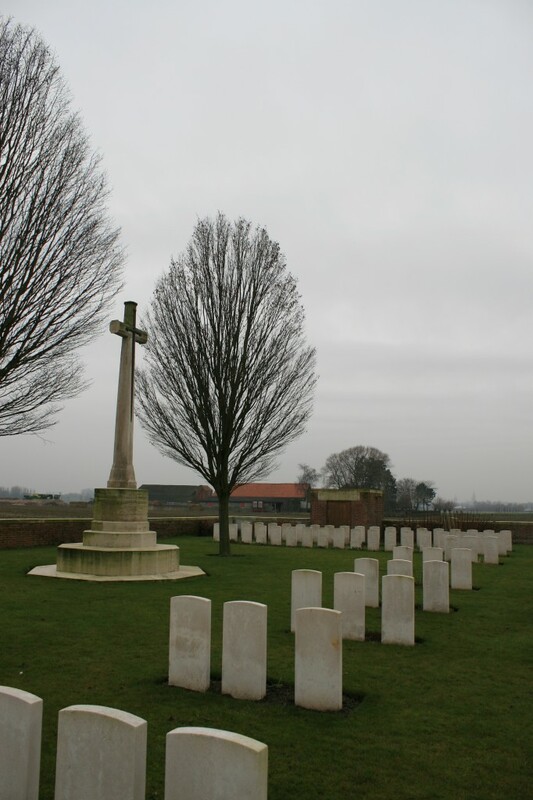 Over the western boundary wall, the spires of Ypres can be seen through the haze on the horizon. Across the field to the right, the cemetery entrance and the French and Belgian flags flying above St. Charles de Potyze Cemetery, where we visited last post, are also visible. *I’m making an assumption here, they could be father and son, for example, but there’s a man out there who will probably put me right. You reading this, John? 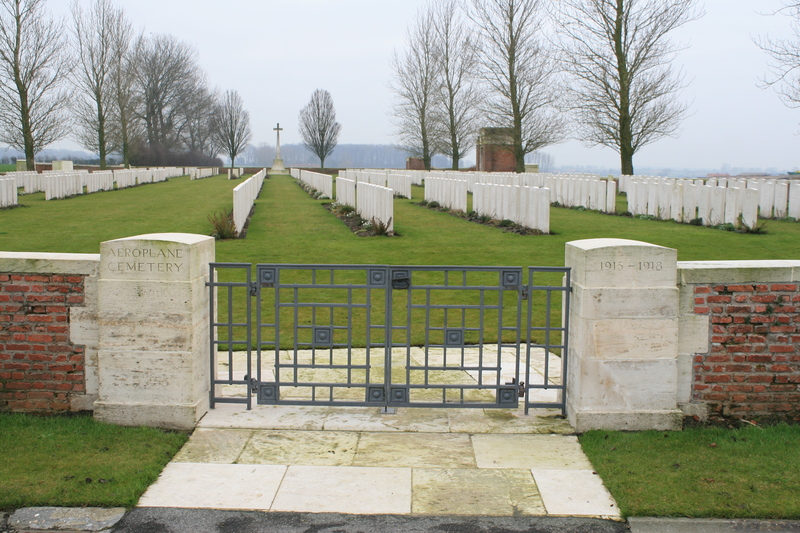 Looking north towards the entrance from between Row B (left photograph) and Row A (right photo) of Plot III, in the centre of the cemetery. Again, many of these post-war burials are unidentified. 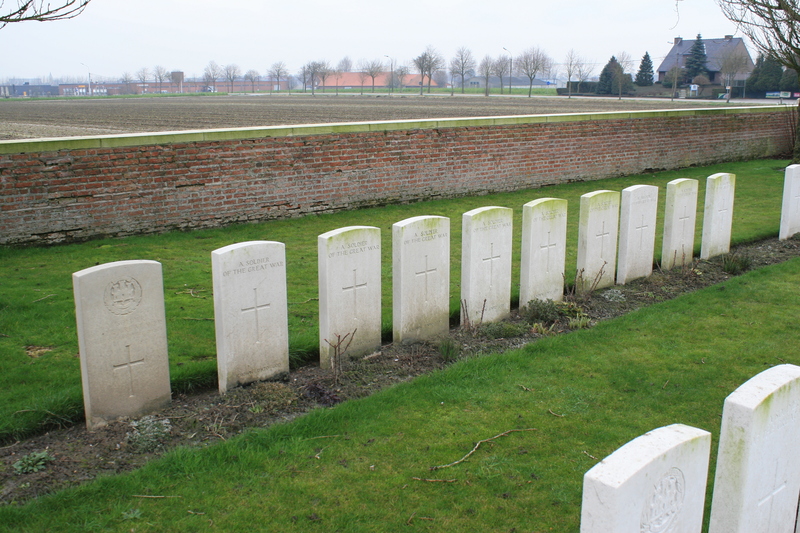 These men of the King’s Royal Rifle Corps, all sadly unidentified, lie in Plot VII. 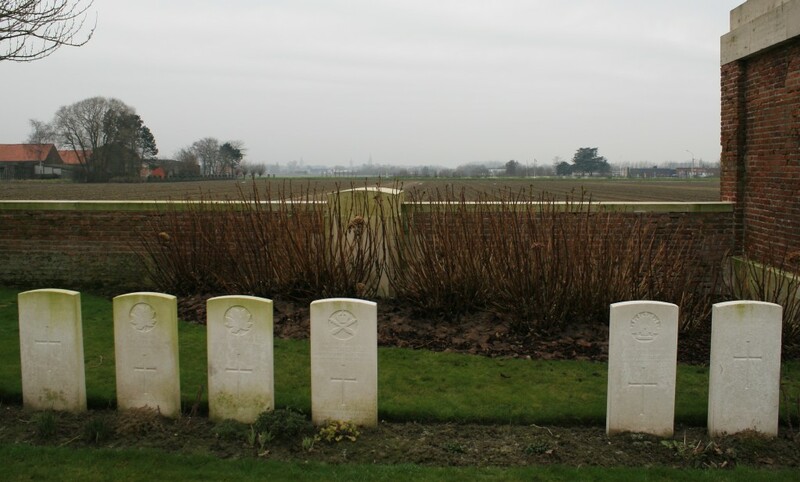 Beyond the cemetery wall, a few hundred yards away across the field in front of us, the British front line once ran from left to right across the picture. 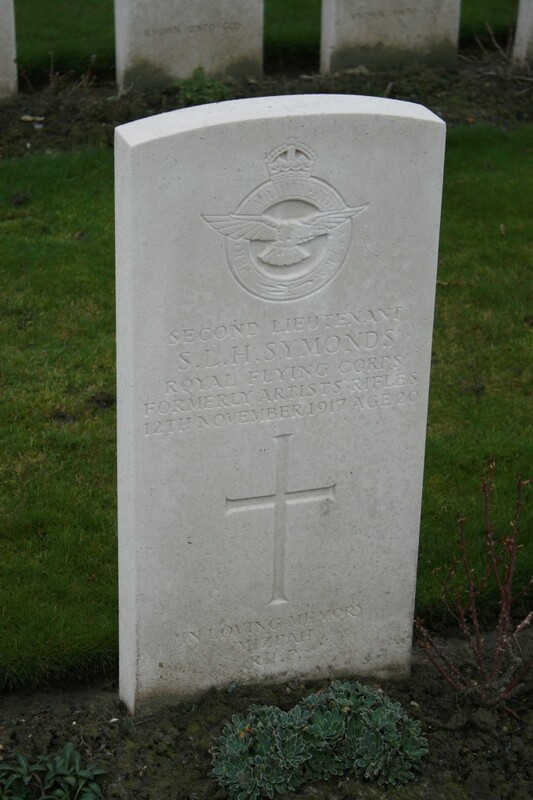 The grave of Second Lieutenant Spencer Symonds in Plot VII, one of just two Royal Flying Corps burials in the cemetery. 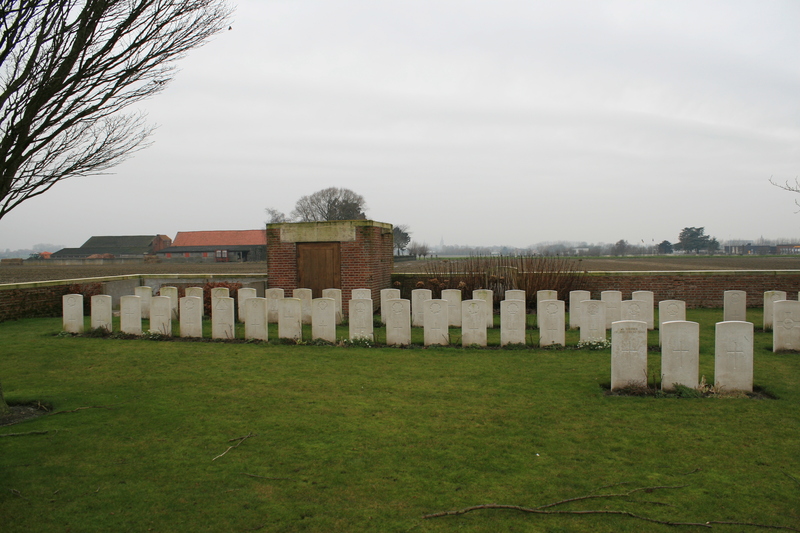 Final view as we end our tour, looking south over the boundary wall down the length of the cemetery. 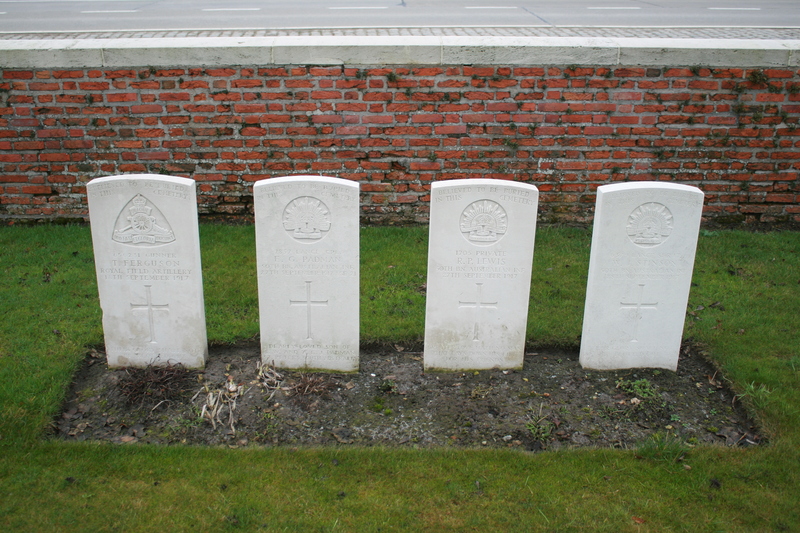 The four headstones nearest the camera are the same ones we saw on first entering. As always, I like your style. 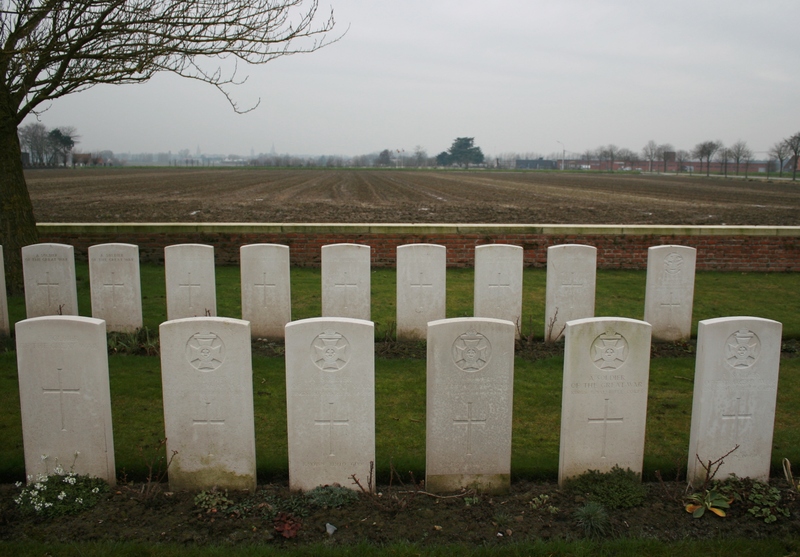 Have just returned from a fine gig in London (Jason Isbell – Google him) and, being English, I am raising a fine cuppa tea to the fallen of Aeroplane Cemetery! And yes indeed, I most certainly did notice the numbers. You would expect nothing less. Hello Sid. Hope all is well with you. Me, I’m just settling down to watch the Ashes before going to bed far too late! I remember you mentioned the piece of fabric from the German plane some time ago. Spoilbank is some three miles south of Aeroplane Cemetery as the crow flies, so not the same plane, but I do wish you would photograph your prize items. I’d be fascinated to see them. Hullo again Mf/MS – I’m thrilled in retrospect that especially today you introduced the Ashes. Even tho’ the GABA is diametrically opposite the fabulous Western Australian WACA ground it seems you’ve had a less than exciting day my friend – so my condolences while the going’s good (to be honest my Surrey born wife tells me there’s three days to go so I should not get too cocky and my late father and mother who was “Australian to the core” reverted to being English when it came to Cricket). Back to WW1 – I’ll open my fire proof well hidden safe and extract my prized possession and photograph it – actually when scanning my records I was amazed I had not already done so. As a rank amateur my question however is: how do I get the image to you – my prowess on the website is limited. Incidentally, for the information of others who will be reading this post, as you Mf know, my late father was in the Western Australian “Old 16th” BN. I’ve now jpeg scanned the 1917 Spoilbank mud and all German plane camouflaged canvas both sides (the first time the inner side has seen light for at least 37 years probably longer). I’ve also scanned a 1918 “get well thankyou for your service to the Mother Country” letter to Dad from the King which you might like to see. As you know my father was in the Western Australian 16th BN “The Old Sixteenth”. Additionally I have a question to ask about how to best remove many paper based WW1 memorabilia which in 1976 were placed in one of those photo albums so popular in that era with narrow strips of sticky across the pages under an clear sheet but the adhesive has stuck to or soaked through the documents. The only email I have for you is MS@SHC – what email will I use to forward my images to you? Sid, can I suggest you either let me know your email address here, and I will mail you privately, or if you don’t wish to reveal your address to all and sundry, I can always mail you from SHC and give you my address. Let me know which you prefer. With regard to your conservation query, I shall enquire for you next week. Could not sleep on a mystery. Frank Manning born 19Apr 1884 Bloxham Oxfordshire, a plasterer by trade 5’7″ tall, next of kin listed as wife in Saskatchewan. Tom Manning grocer by trade, born 14 October same year 1884. Rules out father son pretty effectively. Born in Taunton Sommerset. 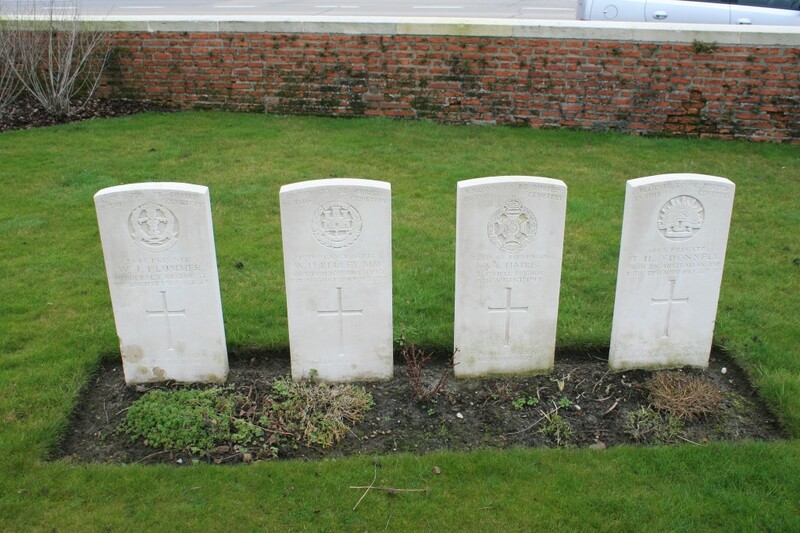 Next of kin listed as father also Tom living in …. Taunton Somerset. Now Tom Jr. and Frank being born just shy of six months apart kind of leans away from brothers, towards cousins? As does being born in different cities. And possibly not cousins either. Surely they must be, but I can find absolutely nothing at all to show that they were related. This is becoming rather more mysterious. For the moment, as it’s late over here, try this for size. If their numbers are sequential, how come Tom’s Attestation Paper is dated 17th April 1915, yet Frank’s is dated 20th April? How exactly does that work? How can the numbers possibly be sequential? Btw, Frank sailed for Halifax from Liverpool aboard the Virginian on 1st March 1912. 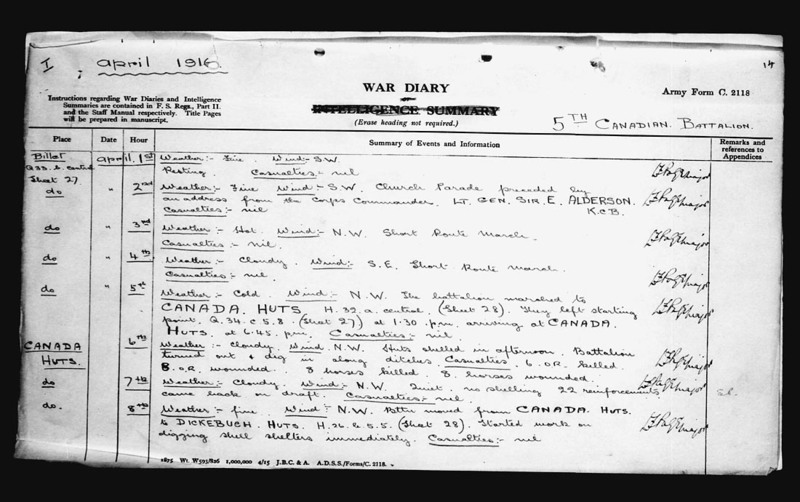 His family don’t appear on the passenger list, but they are in Canada by the time of the 1916 census. Sadly, as we know, without him. 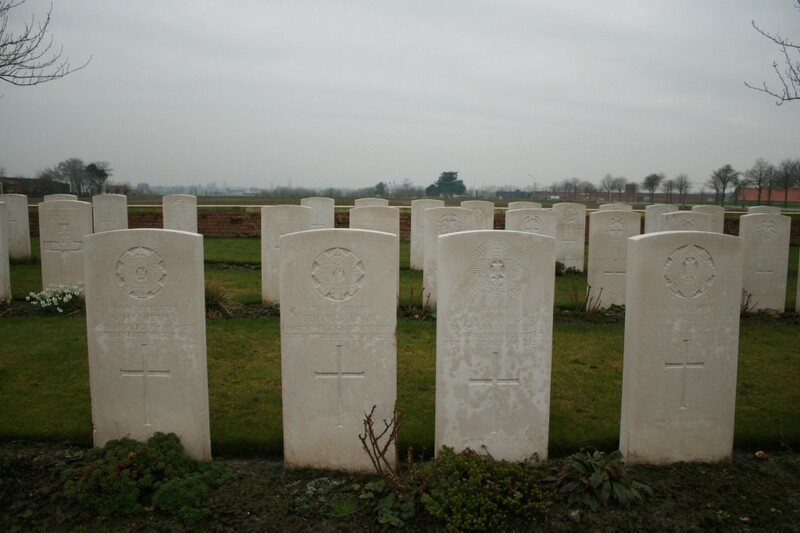 Update: However, having now seen the reverse of the Attestation Papers for both men, the Officer Commanding signed both on the 10th July 1915, so that must be the date they received their service numbers. And here’s the proof: William McCrum (441291); Levi Murtland (441294); Lewis Mason (441295); Thomas Muir (441296); John Millar (441297); John Matthews (441298) – and all signed by the O.C. on 10th July 1915. So for that part of their story I created a mystery for myself and then solved it! How clever am I!!!? But I still cannot find proof that the two Mannings were related. Good stuff John, as ever. I shall try to find out exactly where Canada Huts was. It was certainly a hutted encampment, so well behind the lines (but not outside of German artillery range), but Dickebusch (now Dikkebus) is south west of Ieper and it does say they moved from Canada Huts to Dikkebuch Huts, so…..? As for the Mannings, cousins seems most likely. Honestly, I really do appreciate your research into stuff that crops up on this site, as I’m sure others who read it do as well. Just going through some of our family ‘archives’ as my nephew is studying WW1 at school. Great to have sites like yours to refer to. Hopefully someone out there might be able to help with my query? 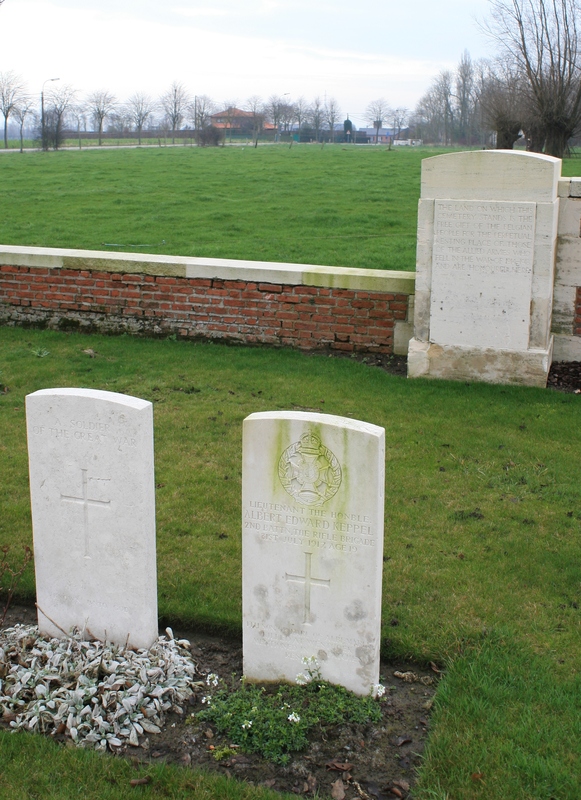 Firstly I understand Aeroplane Cemetery is named because the wreckage of a plane was found on the site – we have a family connection to Flight Lt. RGA Baudry RNAS, he was KIA 2/8/16 and eye witness reports he was ‘3 miles NE of Ypres’ when he went down, is it possible it was his plane (long shot I know!! ), are there any records? He was flying a Nieuport Scout No.3990. If it went down in No Mans Land could it have sat there for a year? 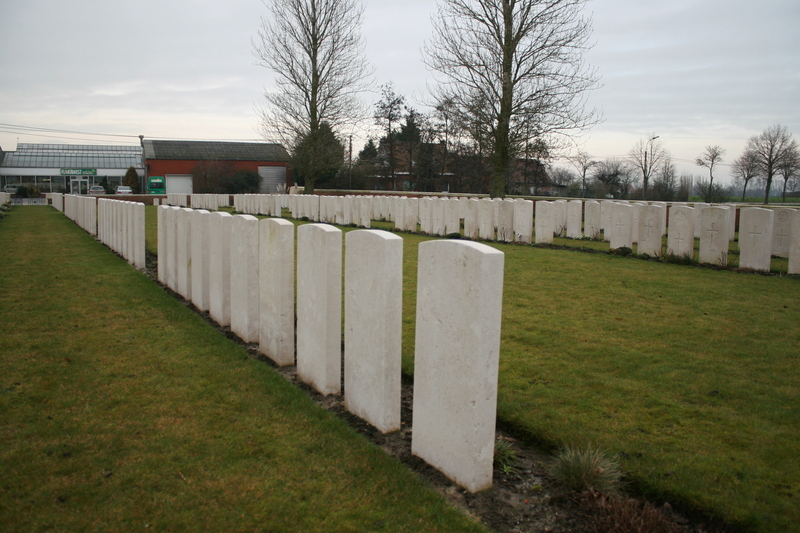 Secondly there is a note on his record, added in 1918 ‘Buried in Cemetery IX Langemarck South’ – any ideas where this is? No grave record on CWGC but memorial at Arras. 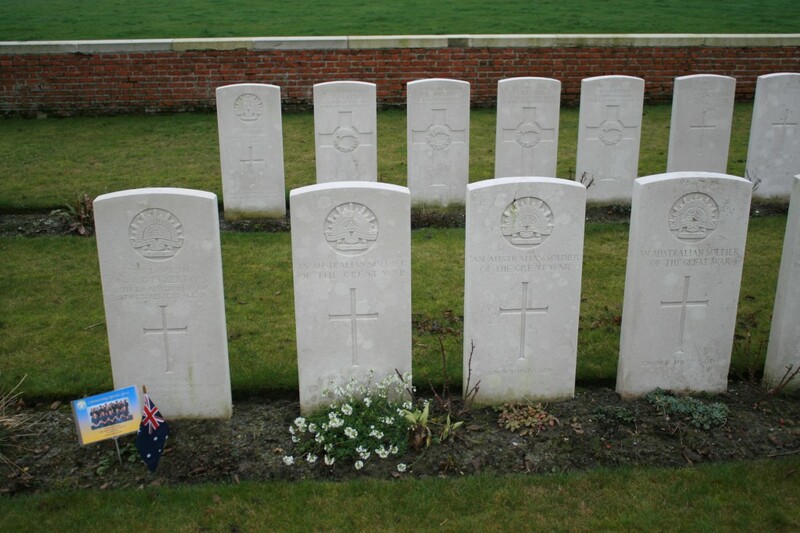 Have visted WW1 sites many times and planning a visit in August 2016 to commemorate the centenary of his sacrifice. Hello Glyn. Your kind comments are appreciated. As I am currently away on a, if I say so myself, well deserved break, and as nearly all of my remaining WWI library is currently in storage anyway (you will know why if you read the Christmas posts), I cannot currently answer your queries, but I will look into Cemetery IX when I return to work next week. As far as the plane is concerned I am pretty sure that if I had any ideas of the identity of the crew I would have included them in the post. Annoyingly I have a couple of wonderful books on the R.N.A.S. that might shed some light on Flight Lieutenant Baudry’s fate, and when I see them again I shall certainly look into it. Best I can offer at the moment. Anyone else? Greetings fellow Great War enthusiasts. The Mannings were indeed cousins from Saskatoon, Saskatchewan in Western Canada. 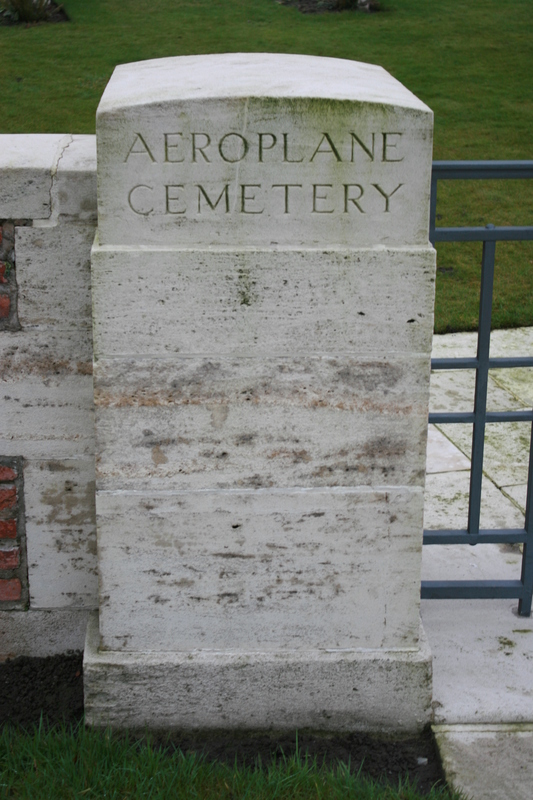 They were exhumed and brought into Aeroplane Cemetery in 1919 after their discovery with 4 other men. A sidebar to this wonderful cemetery is the unknown grave VI. 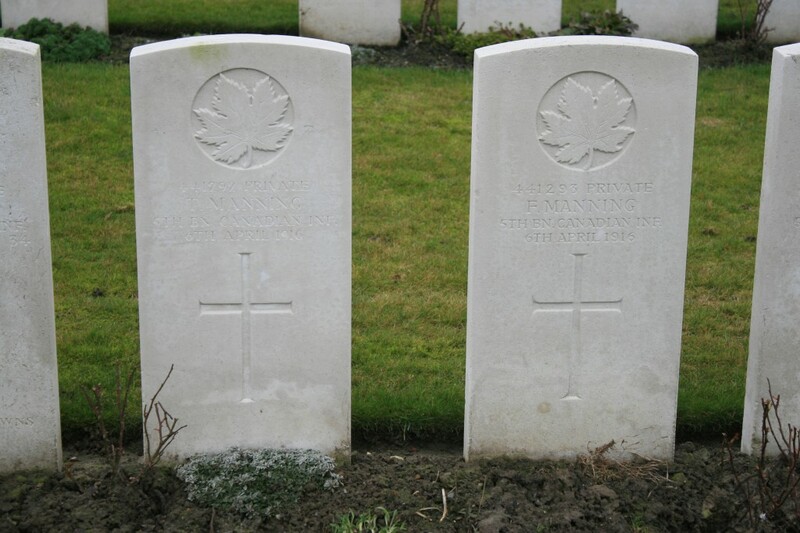 D. 5 which is believed to be Cec Merritt whose son won a Victoria Cross at Dieppe with the South Saskatchewans. Credit to Canadian Historian Norm Christie for these little pieces of research. A truly wonderful site you have. Well done. Hello Glenn. I shall take your comments as the final word on the Mannings, for which I thank you hugely. I don’t suppose any of the Merritt story is featured in one of Norm Christie’s documentaries (oh yes, I know him well enough – from TV I mean!) is it? And thank you for your ever so kind final words. Very much appreciated.